Star Wars: The Force Awakens introduced us to some interesting new characters. The first being Finn, a runaway storm trooper who does not agree with the tactics used by The New Order. The second being Kylo Ren, estranged son of Han Solo and Leia tempted to the Dark Side of the Force to join The New Order (or something else entirely, which we will discuss). The third being Rey, a young orphan who has untrained (and for the most part, unmatched) ability with The Force. The last character of interest is Snoke, a character who appears only via holographic display but has a mysterious position of power and control. Before I get started, I want to discuss Finn a little bit. There are plenty of theories based on his apparent lack of use in The Force that he is not at all able to use it, drawing comparisons to Han Solo and Lando Calrissian. There are even theories that he is the son of Lando (entirely possible, but also maybe improbable). I also do not believe that Finn has no power in The Force. In Star Wars literature (canon to the stories), Han Solo was even able to dabble a bit into The Force. As the movie is titled "The Force Awakens", we have to consider it is about plenty more. Obviously Kylo Ren has been trained for much of his life in The Force, so it is not as though The Force has not existed this entire time, or that there was much true imbalance (consider that Luke is still alive and meditating). I would not put it past Finn being part of The Force, and perhaps his "awakening" to the wrong of The New Order is what truly Awakened The Force. Kylo Ren displays powers we have not seen or thought possible in Star Wars. In the very first introduction to Kylo, we see him stop the laser of a blaster (pure light). Light manipulation was thought impossible, yet here is our Dark Side villain able to stop light mid-air and hold it while he focuses elsewhere. This suggests one of two things. Either the Dark Side of the force has grown so strong that it can control light, or Kylo still has enough light in him to control light. It's widely accepted in Star Wars canon that when it is your time to go, you will die, but if it isn't, you will remain alive until you have served your purpose. Perhaps Kylo's purpose is not to be a Sith Lord. Now I want to discuss Snoke & Rey. I'm not going to be the first to suggest that Snoke is Anakin. And fan theory and a recent "leaked" script suggest that Rey is Anakin reincarnated. I thought of similar when watching The Force Awakens but wanted to dispel them as, at the time, I did not have a logical theory in mind for how either works. While I'm not the first to suggest either of those theories, I will be the first (as far as I'm aware) to suggest that Snoke AND Rey are Anakin Skywalker. So I've bought in that Snoke is Anakin pretty much from the beginning. I never thought Snoke could be Palpatine. In order for Anakin to return to the light, he had to kill Palpatine and restore order. Palpatine did not survive that fall, and he was not as strong as people want to believe him to have been, otherwise he would have never failed at wiping the world out. He knew he couldn't surpass Anakin, so he molded him to be the instrument of destruction that he could not be. So why is it possible that Snoke is Anakin? Let us look at the few theories out there already. Snoke's face is scarred on the forehead and left cheek. 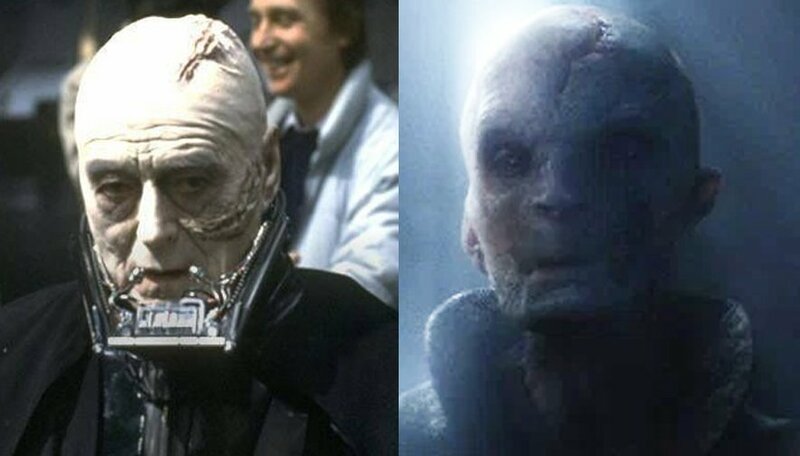 Anakin, when unmasked as Vader by Luke, had a huge scar on his forehead and left cheek. These were there during the burns when Anakin "fell" to Obi Wan Kenobi in Episode III. The image above shows a comparison between the two. How is this possible? Anakin was cremated at the end of Episode VI, and we saw his force spirit appear beside Kenobi and Yoda. I'm not suggesting that Anakin Skywalker did not die. In fact, his death is the premise of this entire theory. Palpatine used the knowledge of Anakin's desire to save loved ones from death—based on his Force Visions—to convince Anakin to join the Dark Side. It was with the revelation of Darth Plagueis' power that Palpatine planted the real seeds of Anakin's turn. If one can prevent others from dying or create life, surely they can return someone from death? Kenobi uttered those words in his battle with Vader in Episode IV. From what we know about Anakin/Darth Vader, there is no way he did not want to learn of everything he could in The Force, especially if it meant making him even more powerful. Considering that Anakin wanted to reach the power of Plagueis (or beyond) it would make sense that the more powerful he is, the closer he would be to achieving such goals. Many have questioned whether or not Palpatine was telling the truth about Plagueis' abilities, but it is accepted in canon that Plagueis resurrected Venamis in the presence of Darth Sidious (Palpatine). So what does that have to do with Snoke? Simple. Someone, at some point, knew enough to resurrect Anakin. Since Snoke is with The New Order (or something greater), we can assume that it was a member of The Dark Side who tried to resurrect Anakin. Why? Because it's Anakin Skywalker. In fact, considering Kenobi's words to Vader, perhaps it was even Sidious through death knowing that his pupil did what he was destined to do and hoping a resurrected Vader would not be Anakin at all. Maybe Sidious had another apprentice he trained and instructed to resurrect Vader once he fulfilled his purpose as Anakin? It would not be the first time someone broke the Rule of Two. So assume with me (even if you think it's a reach) that Snoke is Anakin? Need a further look at how this may be possible? Take a look at the following picture. As you can see from the picture, the eyes are not aligned properly, the left cheek is destroyed, the mouth is off-center (towards the right of the face) and the jaw line is almost a perfect match. The nose is also twisted in the same directions, bent left at the tip, the bridge shifted to the right. My impression from the films is that Anakin's body was resurrected, but since his Force Spirit was seen in canon to be alongside Yoda and Kenobi, I don't believe The Force was revived with him. This may explain why Snoke took Ben Solo and turned him into Kylo Ren. It may explain his knowledge of the Skywalker clan. It may even explain why Snoke has relied on an apprentice who can use The Force instead of using it himself. Snoke does not actually have the ability to use The Force, because his Force Spirit is no longer connected to him. And that brings us to Rey. According to the idea above, Rey is the reincarnation of Anakin Skywalker. While I once believed that Rey may have been a Kenobi, thinking about the fact that she is the reincarnation of Anakin makes a lot of sense the more that I piece together. Perhaps the immortality that was once discussed is strictly about the Force Spirit being able to merge with another host? It would certainly explain how Obi Wan can become more powerful in death. It would definitely be a power that Anakin/Vader would have sought to gain, and there is no reason to believe that he did not achieve such power. The link above also suggests that the idea was that Anakin (I will say his Force Spirit) is meant to exist for eternity as The Chosen One, and emerge whenever imbalance is thrown into The Force (except when that imbalance is Anakin/Vader, I guess). So the idea isn't too insane. In Episode VIII, we see Rey with no training at all (to our knowledge, or hers it seems) able to wield a lightsaber and use the force to call it to her. Rey also has Force Visions (in Cloud City among others, as the above article states). Rey was also called to the lightsaber, something even Luke did not experience. This may be that Anakin's Force Spirit recognized the presence of the weapon and sought its own reconciliation (there is plenty discussing the bond between the lightsaber and the host). There are only few who are strong enough to learn The Force with so little training so late. Even a very young Anakin Skywalker was thought to be too old to train. Luke was also an exception, and Leia to a degree. Rey, however, is not receiving instruction, she is seemingly teaching herself, or recollecting via Anakin's Force Spirit. So my theory is that when Vader's body was resurrected, he was absent his Force Spirit, which sought a suitable host for many years. Someone who loved and craved the idea of family as much as Anakin. Someone who was pure light to combat the evil that the body would teach. So Snoke was born from the rebuilt remains of Vader, and has physical memory, but no power (that we're aware of) to use The Force. After years of searching, Anakin's Force Spirit found Rey and attached to her in order to be the good. It also makes sense when you consider that Snoke was able to sense a great awakening. Perhaps he realized his Force Spirit had returned, and that is why he is so enamored with and desiring to meet Rey? Also consider that Kylo prays to Vader's helmet. Maybe it's his only connection. It would make sense he would adore his grandfather, but maybe he adores Anakin and Vader equally. It may also explain why Snoke told Kylo this is the greatest battle he has faced. Perhaps Snoke knows that Kylo worships Anakin and Vader, and knows that he is going to be torn no matter how committed he acts. Finally, consider Rey's meeting with Luke. It's brief, but powerful. She goes to hand the lightsaber to Luke, who stares at her as though he knows exactly who she is but just can not believe it. Luke also does not reach out to grab the lightsaber, and according to the "leaked" information, he may end up revealing to Rey that the lightsaber belongs to her, not him. Let me know in the comments what you think of my speculation, if you agree, disagree, have anything to add or dispute. We will find out the truth in Star Wars Episode VIII in December 2017.